﻿ H. Potrebica (Zagreb). 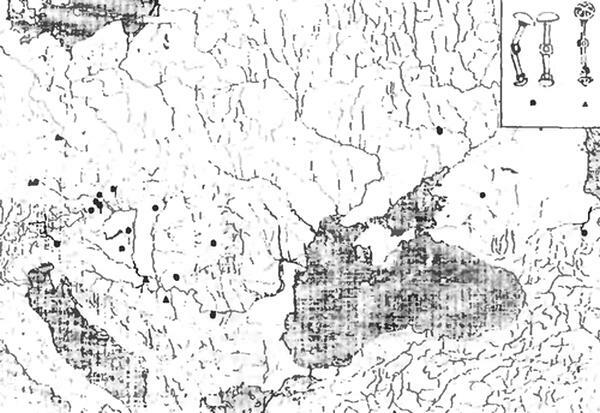 Pontic-Caucasian influences in Southern Pannonia and the Eastern Hallstatt Culture. под ред. Е.В.Ярового.Древнейшие общности земледельцев и скотоводов Северного Причерноморья (V тыс. до н.э. - V век н.э.). In the Late Bronze Age southern Pannonia and the southeastern Alpine region were the area of the Urnfield Culture, while in the Early Iron Age it was the area of the Eastern Hallstatt Culture. The main feature that could be connected with the eastern influences is the Hallstatt warrior concept that was created in the process of transition from a rather leveled social frame of the Urnfield Culture to the highly stratified and hierarchical society of the Early Iron Age. Although a clearly defined warrior aristocracy dominated Hallstatt society, it is very hard to identify the so-called «Thraco-Cimmerian» presence that allegedly triggered that transition. However, it is obvious that an outside factor strongly influenced the local population and transformed their social structure introducing a strong horsemen element that eventually developed in warrior aristocracy. Horse equipment that appeared in the Early Iron Age, in the area of the Southeastern Europe, has no typological predecessors in this area, but it could be linked with southern Russia and the Caucasus. 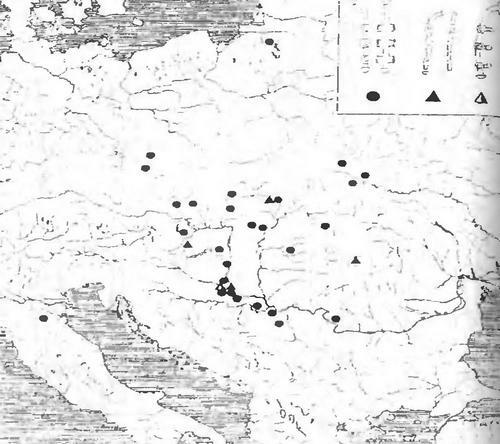 A number of authors (Reinecke, 1925; Gallus, Horvath, 1939) attributed those finds to the invasion of warrior horsemen from the area of Pontic steppes. They connected the appearance of large amount of horse equipment in central Europe with ancient historic sources that mention conflict between Cimmerians and Scythians in Pontic steppes, after which Cimmerians withdrew from the area around Tyras (Dniestar), and went from there along the Black Sea west of Caucasus to the area of Sinope [Herodotus, IV, 48-49; V, 10]. Strabo describes the alliance of Cimmerians with thracian tribes of Treri and Edoni, and that was the basic argument for the theory on «Thraco-Cimmerians» whose raids caused dramatic changes in that area at the beginning of the Early Iron Age in Southeastern and Central Europe. However, there is no other confirmation of their movement westwards in the antique sources and the results of archaeological excavations also discard that theory. There is also a chronological problem. Objects usually associated with Cimmerians were initially dated into the end of the 8th century ВС, but bronze psalia characteristic of these influences were found in Hungary and Romania together with bronze axes dated into На B2 and B3 periods. In addition to that, some eastern influences are visible even on earlier Pannonian material of Ha A I period (Metzner-Nebelsick, 1998). This suggested that alleged Cimmerian movement to the west would have to be dated at least one century earlier that is, prior to the reports on the Cimmerian threat in the area of Urartu (Bouzek, 1983, 234; Kossack, 1980, 110). If we consider this problem at a more general level, we see that during the period between the end of the 9th and the beginning of the 6th century ВС eastern influences intensively spread throughout Europe in different manners and in different ways (fig. 1). Greece is probably the best example,because these influences were one of the most important cultural components of the Archaic period. Regarding the Eastern Hallstatt area, among a wide variety of differently dated objects bearing eastern characteristics, the most important group is that of the so called, «Cimmerian» bronzes. It mainly consists of bronze horse equipment (fig. 2) dated into the 8th and the first half of the 7th century BC (Kossaek, 1480, 104-114). Although the idea behind these objects definitely came from the East, the analysis of their distribution marked them as Pannonian types, much more present in central Europe and Pannonia than in southern Russia, (fig. 3,4). This suggests that somewhere in this area there were workshops that were actually producing them, such as Sv. Petar Ludbreski, in northern Croatia (Simek, 1478). 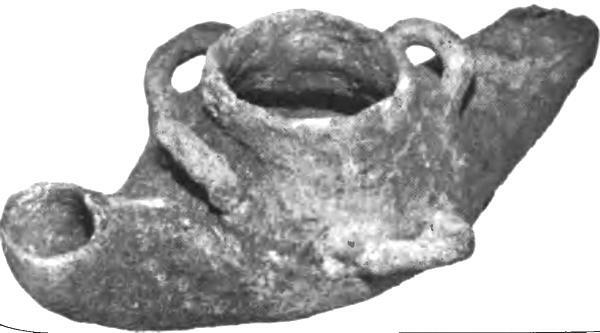 Although a new form of horse horse and riding was developed on the other side of the Carpathians and new production techniques could not be transferred without some contacts with these population actual objects show independent and local characteristics as they probably continued local metallurgical tradition suggested by the Late Bronze Age hoards from the area (Vinskt-Ciasparini, 1973). 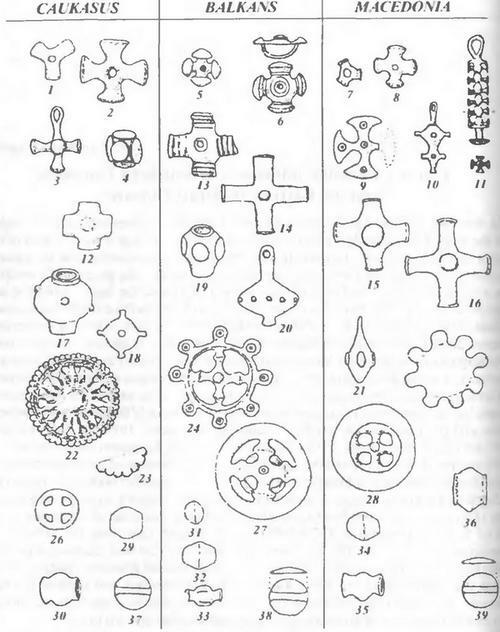 Everything suggests that the production of such objects was organized on the level of local Hallstatt groups in an attempt to answer to new demands (Potrebica, 1448). Eastern influences played a crucial role in the process of social and cultural change at the end of the Late Bronze Age that resulted in the Hallstatt Culture. According to the inventory о I the Eastern Hallstatt graves, only horse equipment was widely accepted. There are just a few finds of weapons, while changes in attire, decorations and ornaments are absent. Since the female attire, together with religious concepts, is one of the most conservative elements of any culture, it seems that the change in the material culture of the Hallstatt populations does not reflect sudden and general adaptation to completely new cultural environment. It was more a reaction - society changed only those elements necessary for keeping continuity in changing circumstances. It also seems that the Hallstatt Culture did not replace the Urnfield Culture as an outside or foreign element. The different organization of society and acceptance of new weapons that changed the whole warrior concept in a large part of Europe in the 8'th century ВС was not imposed. The material culture suggests that changes originated within the society - they were no°t brought by the eastern influences, but developed against them. Under the constant pressure from the East, warriors became very important and prominent members of the society. That change was formalized by the social structure of the Hallstatt Culture (Potrebica, 2001, 70). The analysis of so called «princely graves», in the area of the Eastern Hallstatt Culture shows that cultural contact with the eastern cultures could only have been achieved through some sort of mediator, such as the Fuzesabony-Mezocsat group or population of the Carpathian basin. In fact, large amount of bronze and iron horse equipment does not tell us about warriors, but about horses The horsemen warriors that appeared in the East and the feeling of general unrest in that area, stimulated the acceptance and development of technically superior horse-gear that was new on this side of the Carpathians as a response to that threat. From the populations that were exposed to the strongest pressure from the East and quickly changed and adjusted their material and social structure, the influences spread westward. (Potrebica, 2001, 70). 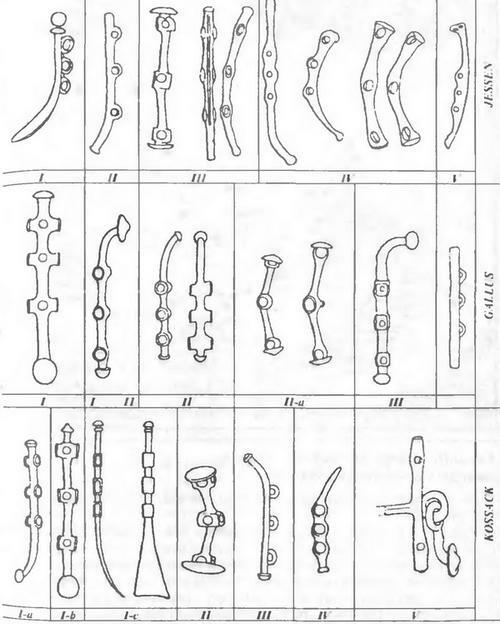 The result was production of «uniform» types of horse equipment that were developed on the eastern prototypes, but have the same characteristics both in the East and the West (fig.2). Such production was based in Pannonian centers western of Danube (fig. 3) from where such types spread further westward and soon became standard part of the warrior equipment. The change in warrior technique were followed by the changes in the warrior concept, and newly formed warrior «aristocracy», together with development of metallurgy and trade brought about fundamental changes that marked the beginning of the Iron Age in this area. It seems that instead of some nomadic invasion and presence in central Europe and Pannonia, different phenomena happened on a much smaller scale through a longer period of time. These phenomena probably included some individual migrations during the late Hallstatt period, but were mostly based on intercultural communication between similarly structured social and cultural groups. One of the main features of such communication is the exchange of prestigious goods between the elites of different groups. Such mechanism enables long distance diffusion of ideas and concepts. The change of social structure and economy west of the Carpathians that made these cultural groups open to influences from the East could be explained by the change of climate that since the middle Bronze Age turned a part of the Carpathian basin into steppes (Bouzek, 1983, 177-238), and thus induced change in the life style and economy that made this long range cultural interchange possible.